In signing the form individuals "make their commitments in solidarity with traditional Jewish practice and history." 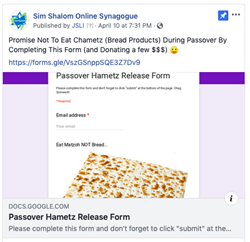 In honor of the traditional Passover custom of "selling" one's chametz in order to rid your home of any leftover bread products Rabbi Steve Blane has created a newly envisioned contract for the modern Jew. You can access the form on the Sim Shalom Facebook page here.